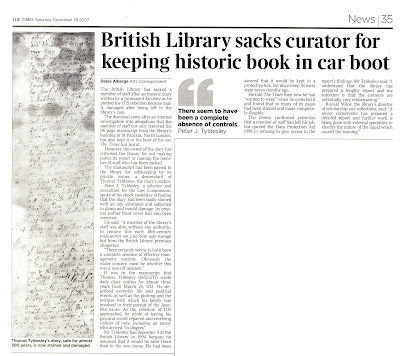 The British Library has sacked a member of staff after an historic diary written by a prominent Jacobite as he plotted the 1715 rebellion became badly damaged after being left in the library's care. The dismissal came after an internal investigation into allegations that the member of staff not only removed the 96-page manuscript from the library's building in St Pancras, North London, but also kept it in the boot of his car, The Times has learnt. However, the owner of the diary has criticised the library for not making public its report or naming the member of staff who has been sacked. The manuscript had been passed to the library for safekeeping by its private owner, a descendant of Thomas Tyldesley, the diary's author. Peter J. Tyldesley, a solicitor and consultant for the Law Commission, spoke of his shock yesterday at finding that the diary had been badly stained with an oily substance and subjected to damp and mould damage. Its original leather front cover had also been removed. 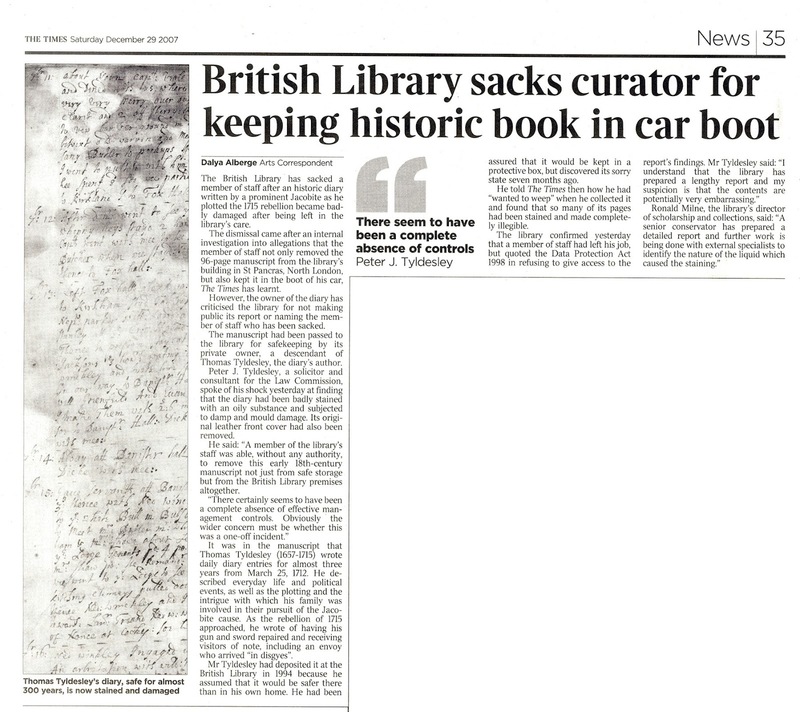 He said: "A member of the library's staff was able, without any authority, to remove this early 18th-century manuscript not just from safe storage but from the British Library premises altogether. "There certainly seems to have been a complete absence of effective management controls. Obviously the wider concern must be whether this was a one-off incident." It was in the manuscript that Thomas Tyldesley (1657-1715) wrote daily diary entries for almost three years from March 25, 1712. He described everyday life and political events, as well as the plotting and the intrigue with which his family was involved in their pursuit of the Jacobite cause. As the rebellion of 1715 approached, he wrote of having his gun and sword repaired and receiving visitors of note, including an envoy who arrived "in disgyes". Mr Tyldesley had deposited it at the British Library in 1994 because he assumed that it would be safer there than in his own home. He had been assured that it would be kept in a protective box, but discovered its sorry state seven months ago. He told The Times then how he had "wanted to weep" when he collected it and found that so many of its pages had been stained and made completely illegible. The library confirmed yesterday that a member of staff had left his job, but quoted the Data Protection Act 1998 in refusing to give access to the report's findings. Mr Tyldesley said: "I understand that the library has prepared a lengthy report and my suspicion is that the contents are potentially very embarrassing." Ronald Milne, the library's director of scholarship and collections, said: "A senior conservator has prepared a detailed report and further work is being done with external specialists to identify the nature of the liquid which caused the staining:"